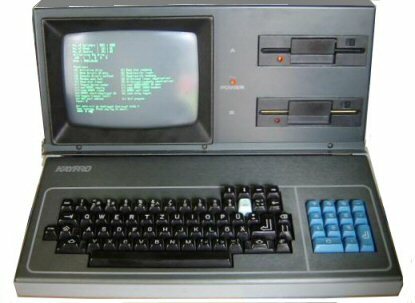 In 1981 Andrew Kay had the idea to build personal computers, and he realized that dream in 1982 with the Kaypro II, which was a great step forward compared to his rival Osborne-1. 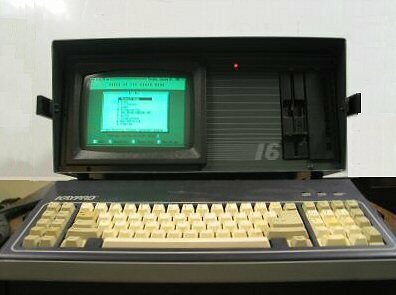 The Kaypro II owns a 9" green monitor which was capable to show 80 chars a line - ideal for word processing (at this time). 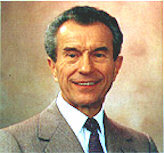 Also, it was the first CP/M computer with a comprehensive software paket (from Perfect Software). One of the disk drive is always selected (even nothing is done), this was changed with several third party firmware ROMs, like the famous Advent TurboROM or the better, but less known >KayPlus ROM<. The KayPlus ROM is still downloadable at the above URL/page ! I haven't found Plu*Perfect Systems in the internet anymore, so I offer a download for this 8 KB Advent TurboROM (Version 3.4) >here<, for the utilities and docs see >here< or documentation in readable 'PC' text >here<. I will remove this link asap if the original copyright holder inform me that this offer is not desired. Btw. I offer here a german CP/M 2.2 bootdisk for the Kaypro II also >here<, other can be found >here< or look for system / install disks >here<). Two mainboard versions were shipped with the Kaypro II's, one without, and one with the ability of controlling double sided floppy drives. 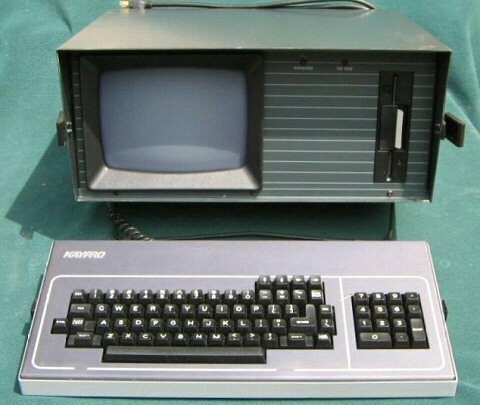 There was also a Kaypro IV (aka Kaypro 4'83) and a Kaypro 4'84, which can be distinguished by comparing the floppy drive height (IV was equipped with full height drives, 4 with half height ones). 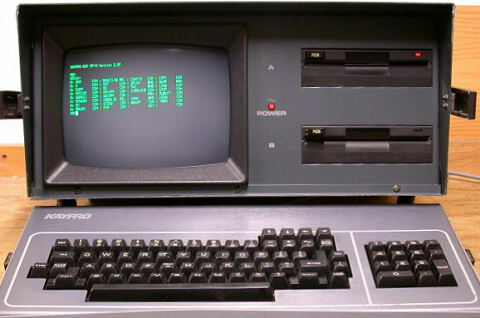 Above, a Kaypro 4 is shown (with a 4 MHz Z80). Btw. again... I looked for a CP/M 2.2 bootdisk for the Kaypro IV with german keyboard support for years, but I found one meanwhile - can be d/l'd >here<, other can be d/l'd >here< or look for system / install disks >here<). 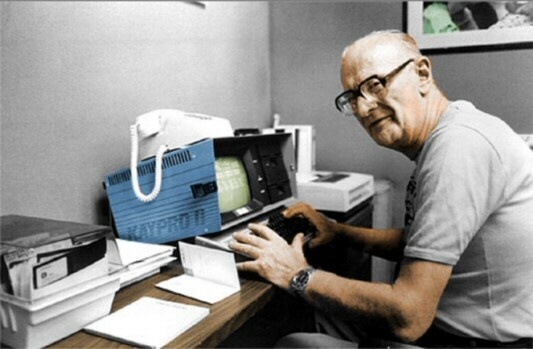 Looking for Kaypro 16 software ? See >here<. There was also a ROM named 'Universal ROM', which replaces all other versions later. There were also Kaypros relabeled as "Omni II Logic Analyzer" with an additional logic analyzer board and interface. The Kaypro's with +88 have an optional board with an Intel 8088 CPU and 256 KB RAM, so it was possible to run MS-DOS also. And finally may be also here:>retroarchive< (also for Kaypro 16!). a CP/M manual *very* similar to the original Kaypro CP/M documentation can be found >here<. You can start to transfer software by reading >this article<, or just read my pages about >all disk transfer possibilities<. 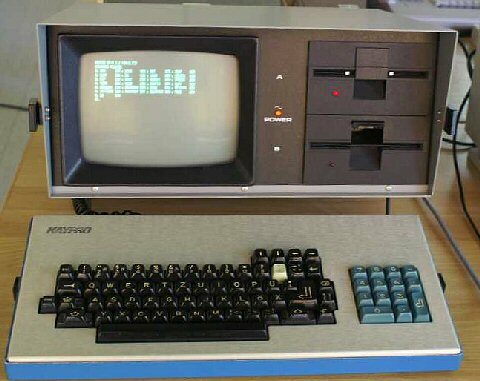 He wrote his science fiction novel "2010" with the help of a Kaypro II (he lived also in Sri Lanka, and used a modem for transferring documents, some details can be read >here< about it). Copyright (c) 2005-2016 Peter Dassow. All rights reserved.